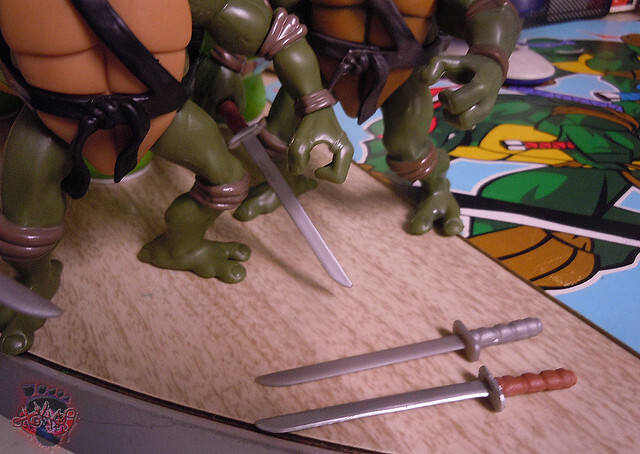 –&gt;&gt; This is the part in the set where things start to get really interesting. 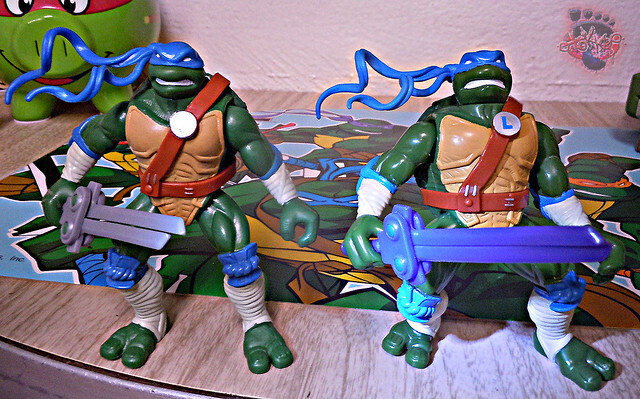 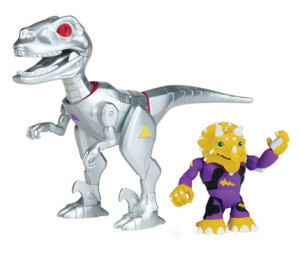 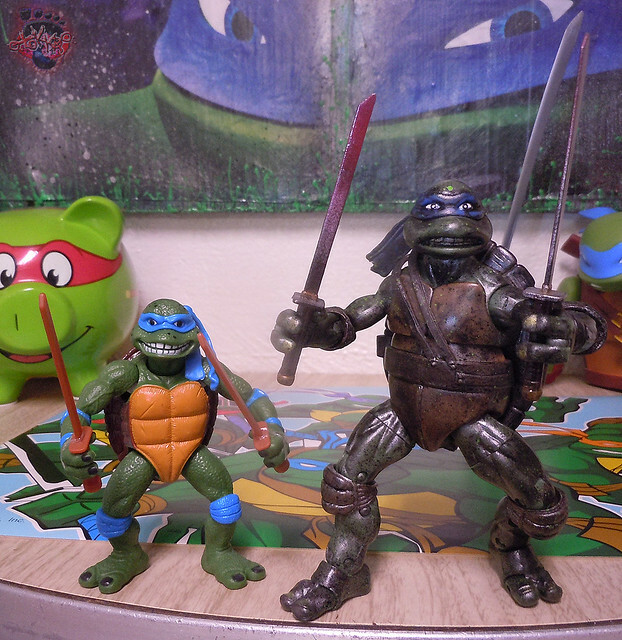 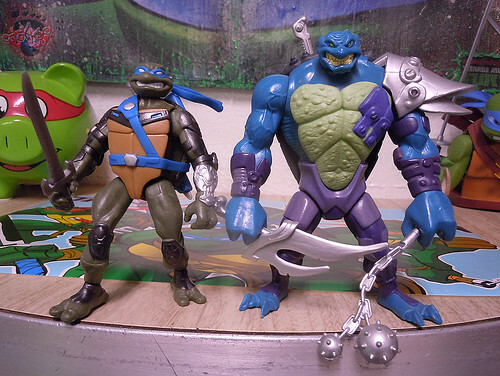 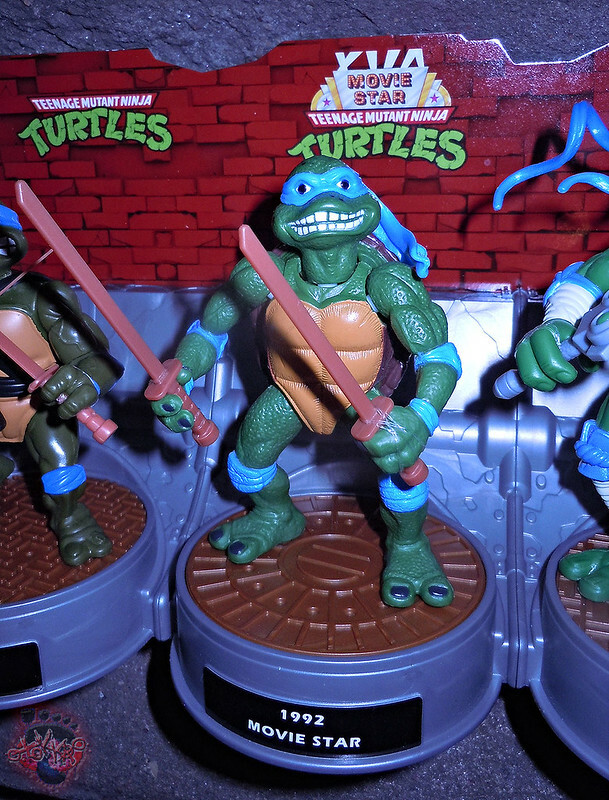 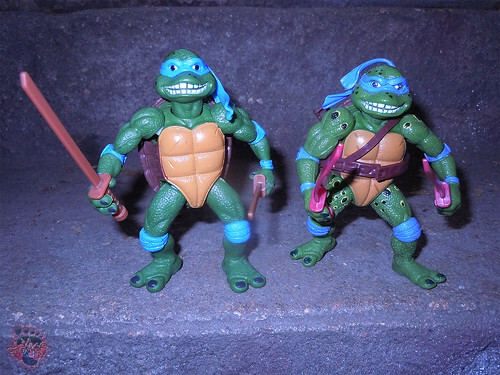 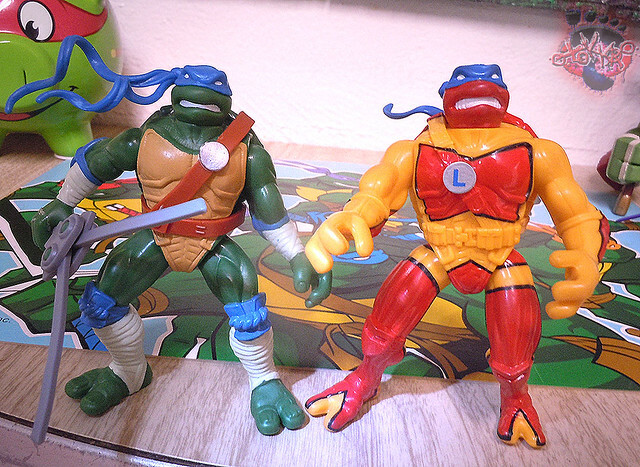 The notable differences on these repro Leo toys really stands out starting here. 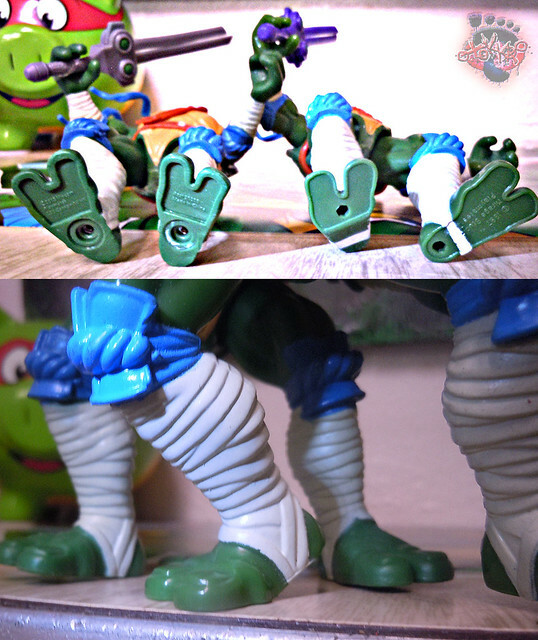 Varner’s original Sculpt has been modified at the feet, prolly due to display issues. 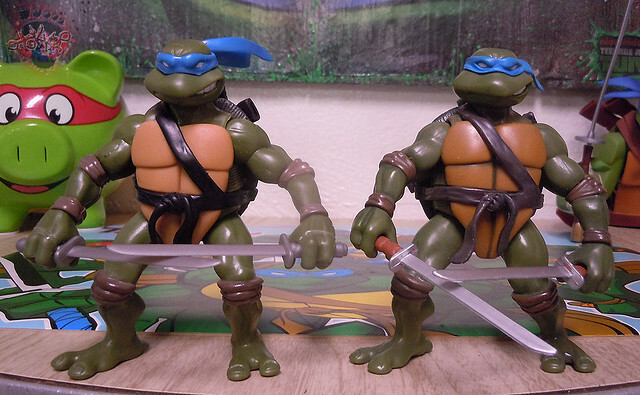 Now with larger toes, missing scabbard &amp; belt ( for some reason ), lack of paint compared to the detailed original release, and the bandanna piece on the noggin has swapped sides ( similar to the ’92 prototype ) compared to the ’92 figure. 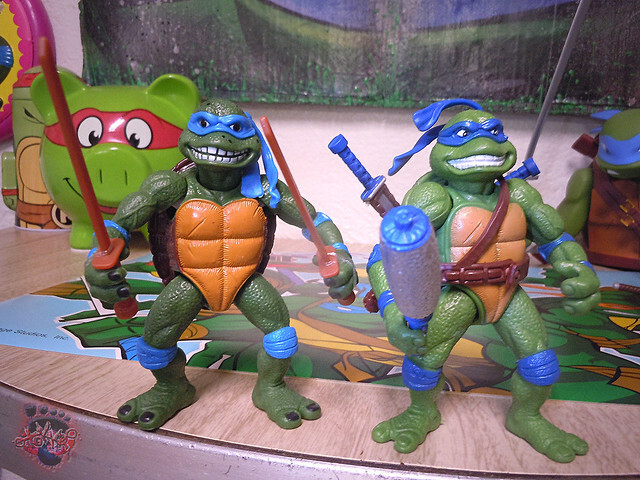 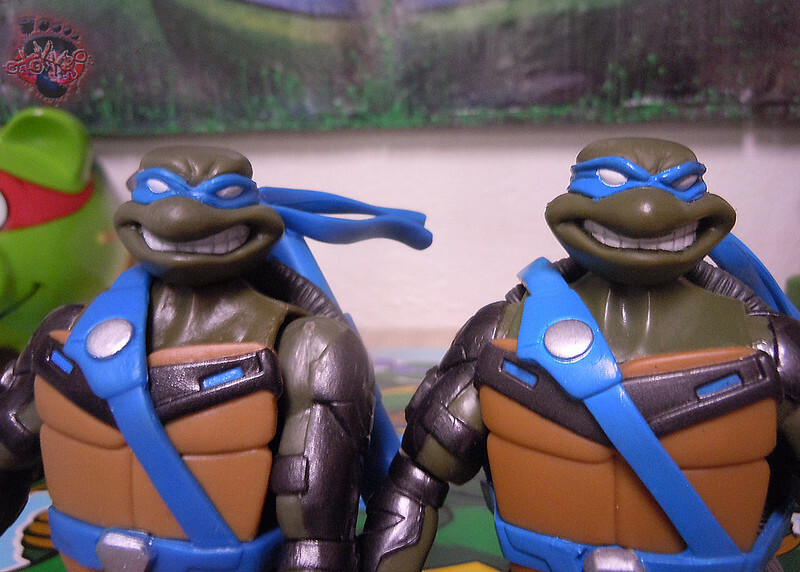 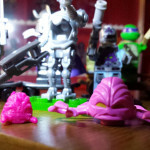 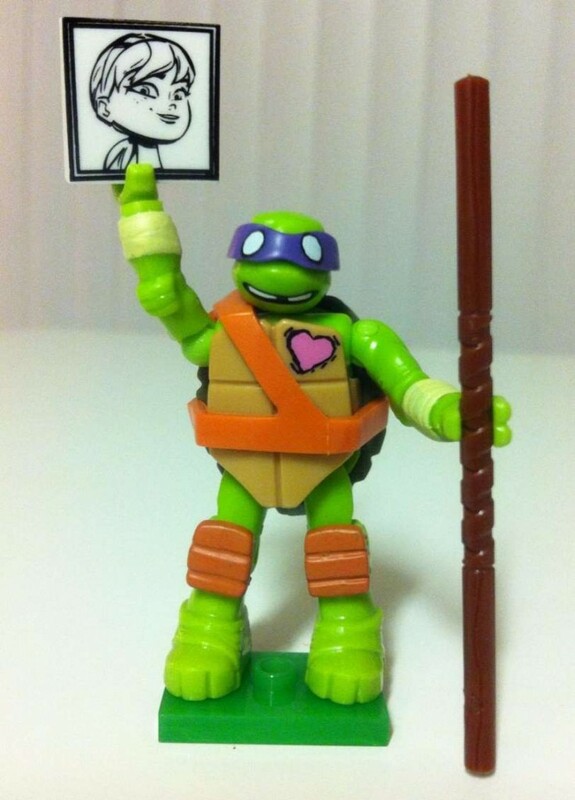 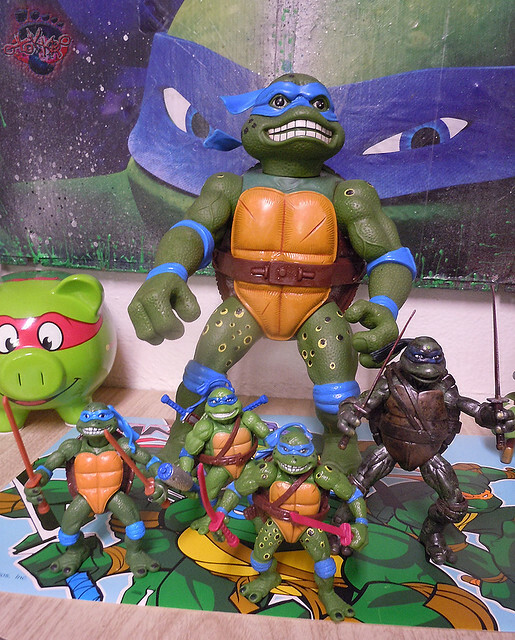 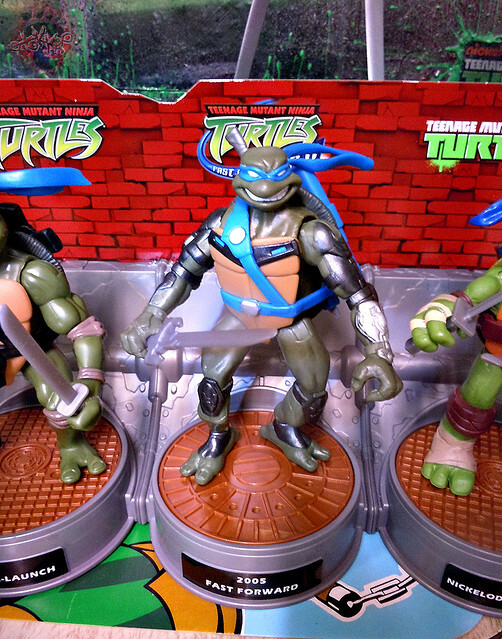 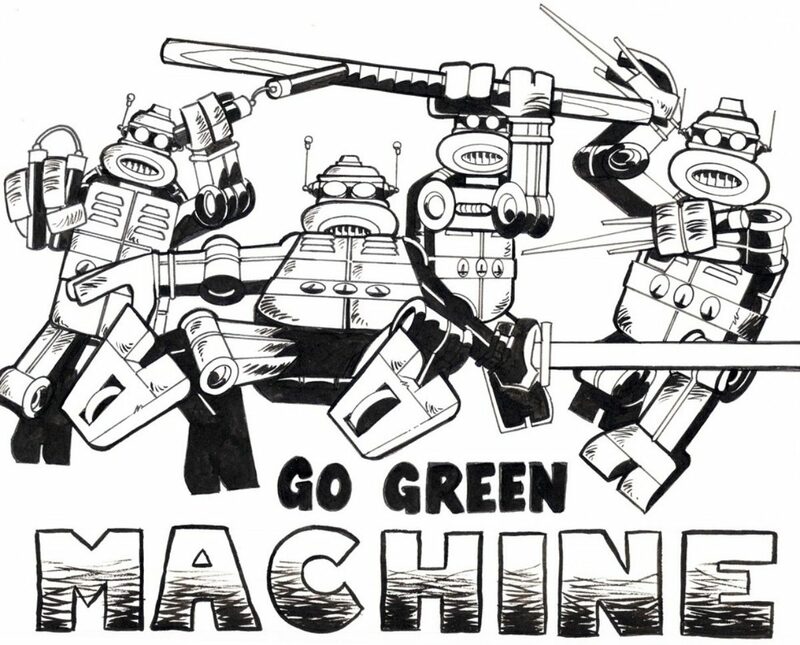 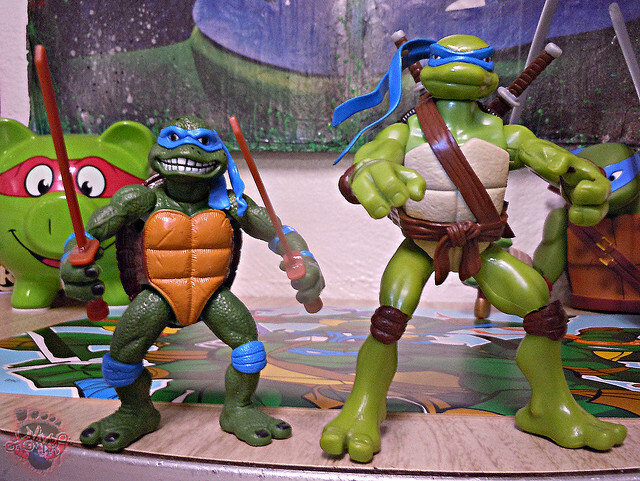 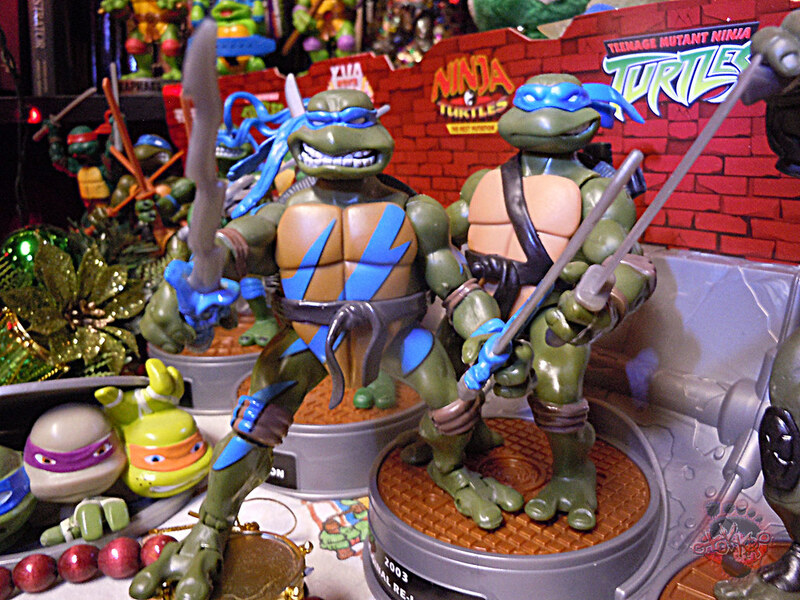 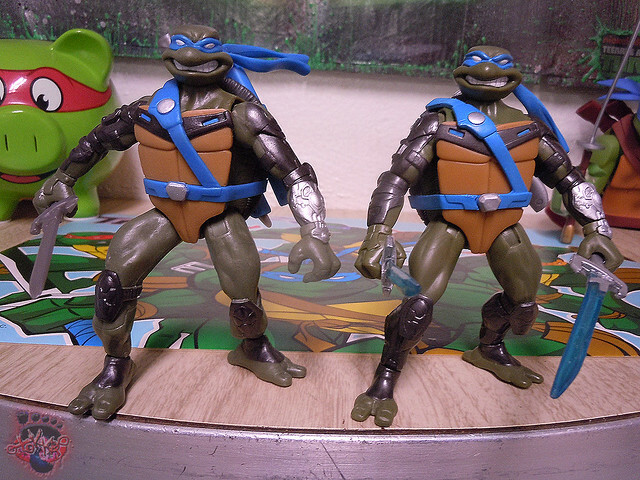 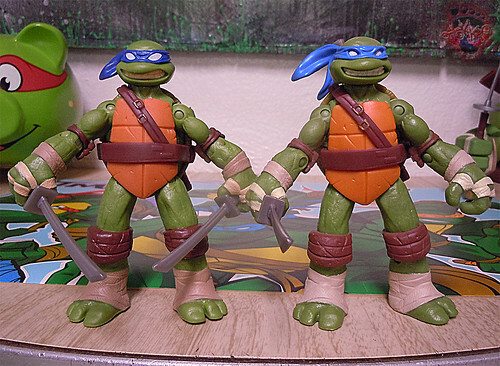 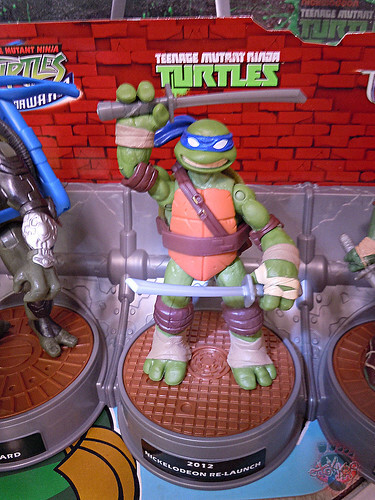 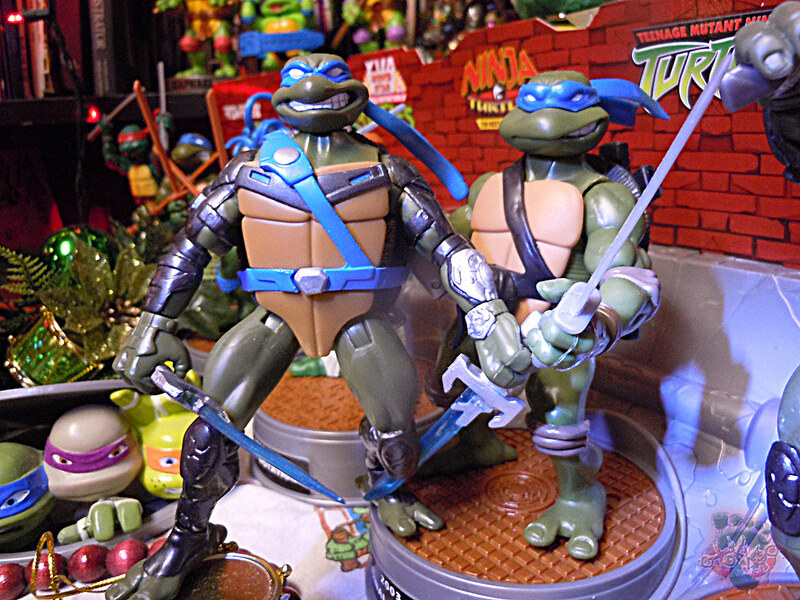 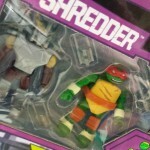 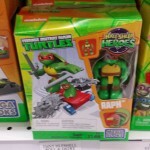 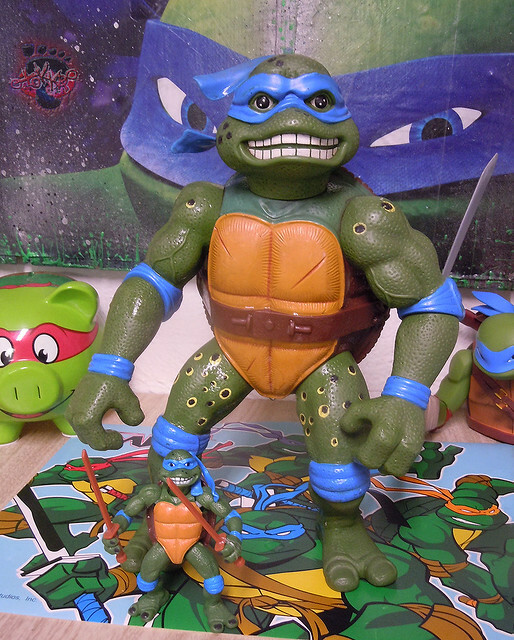 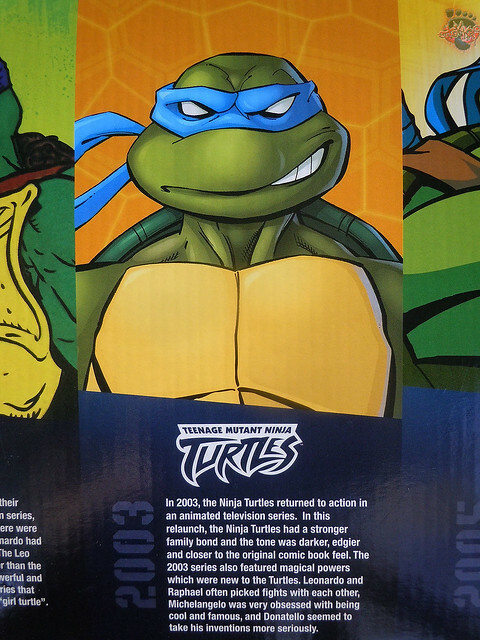 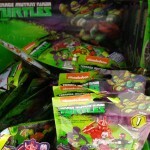 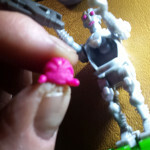 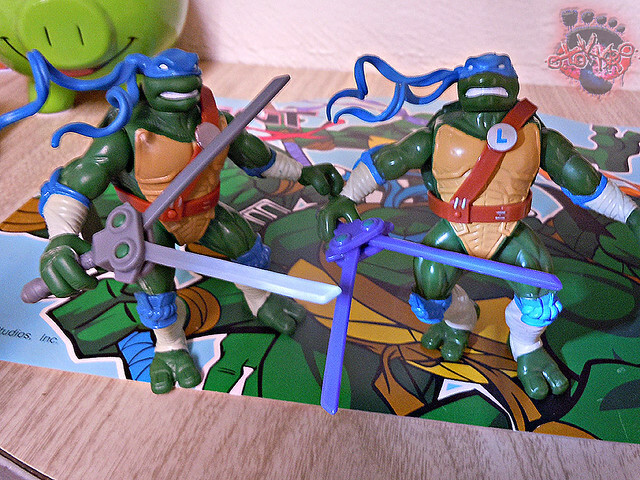 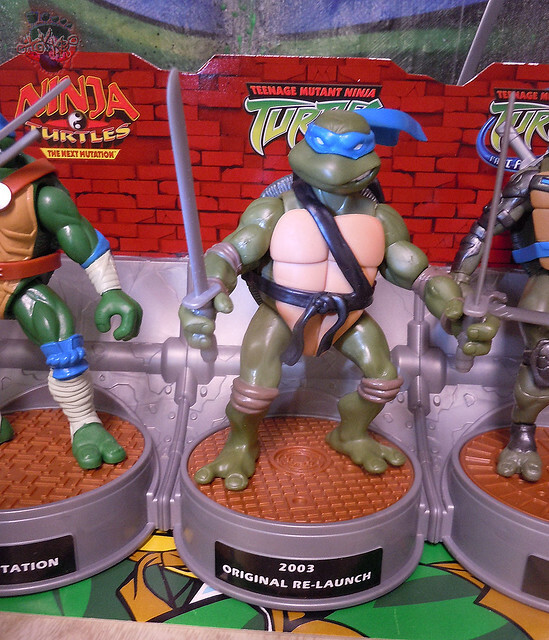 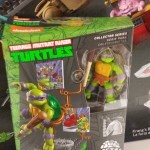 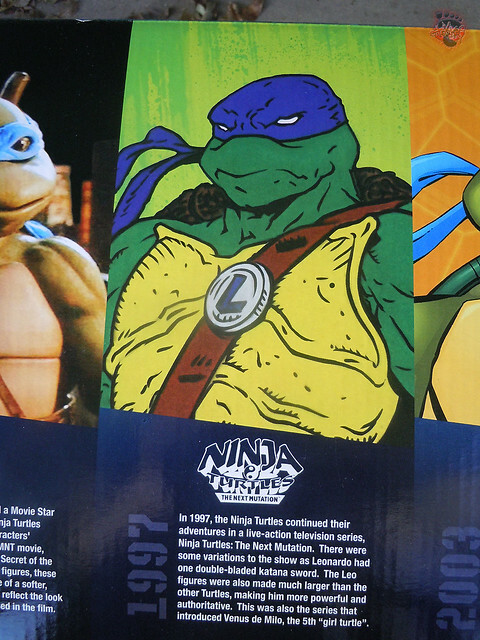 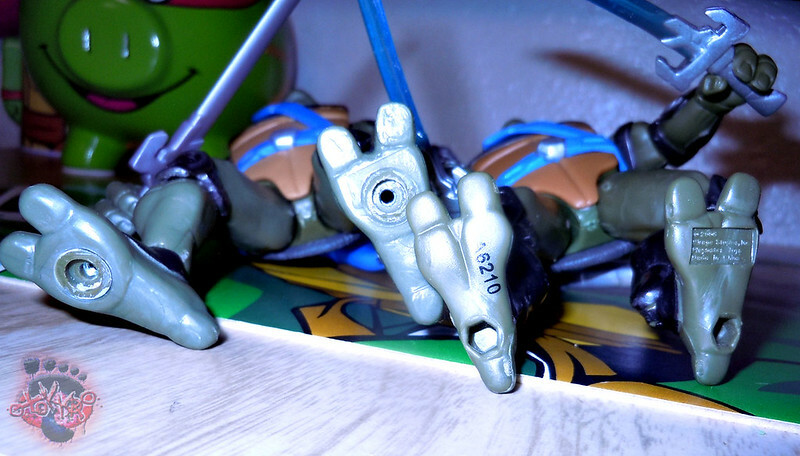 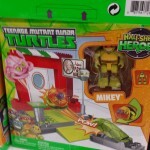 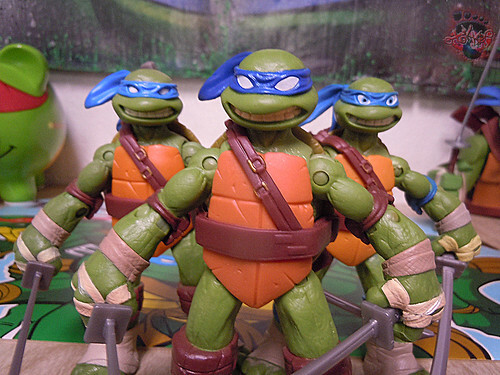 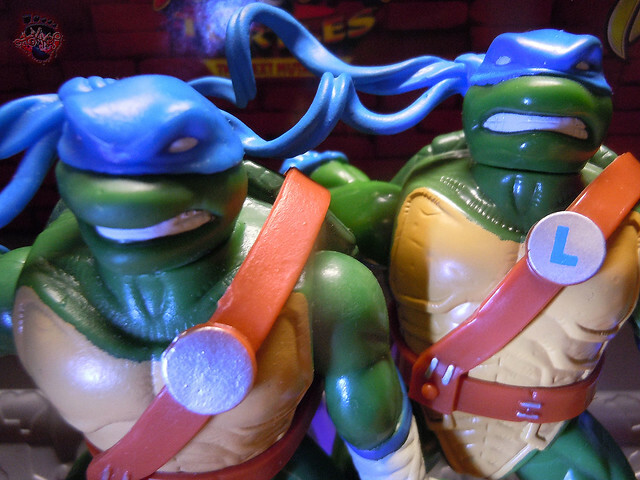 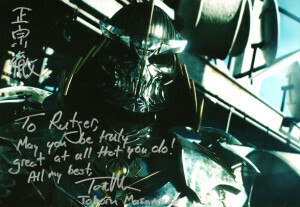 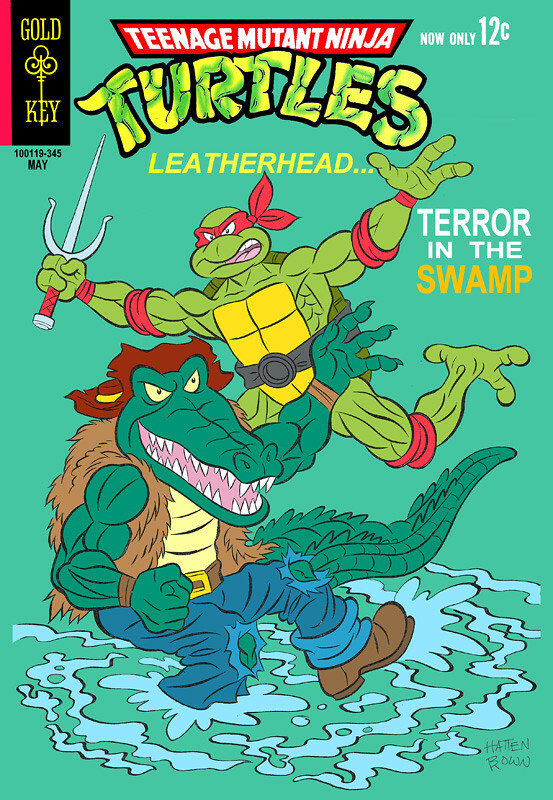 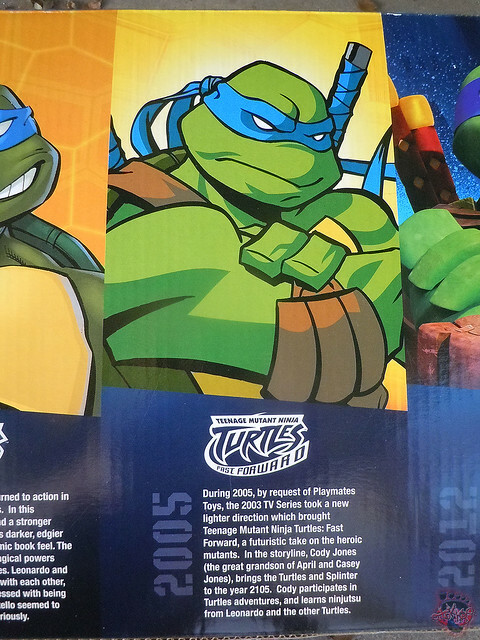 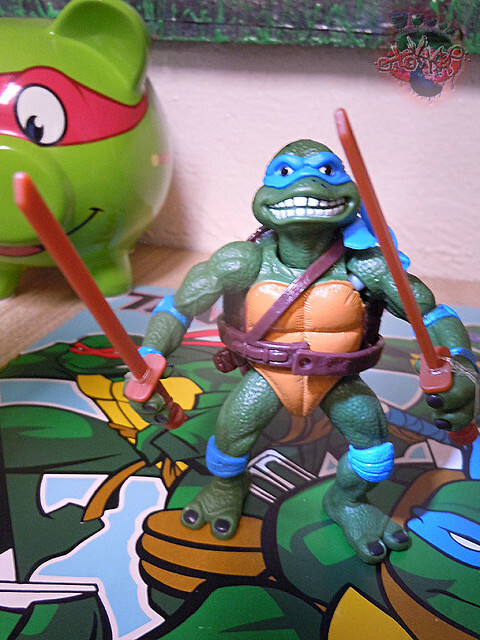 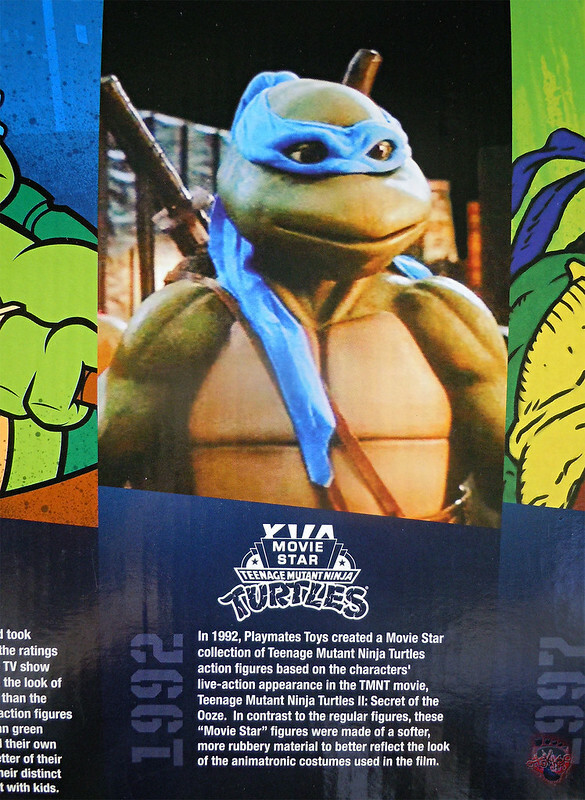 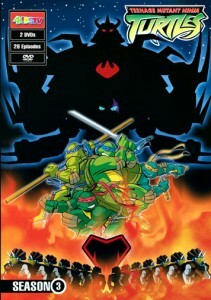 The plastic is harder also, the original had a softer &quot;REAL FEEL&quot; rubbery texture to the turtles head, arms, and legs. 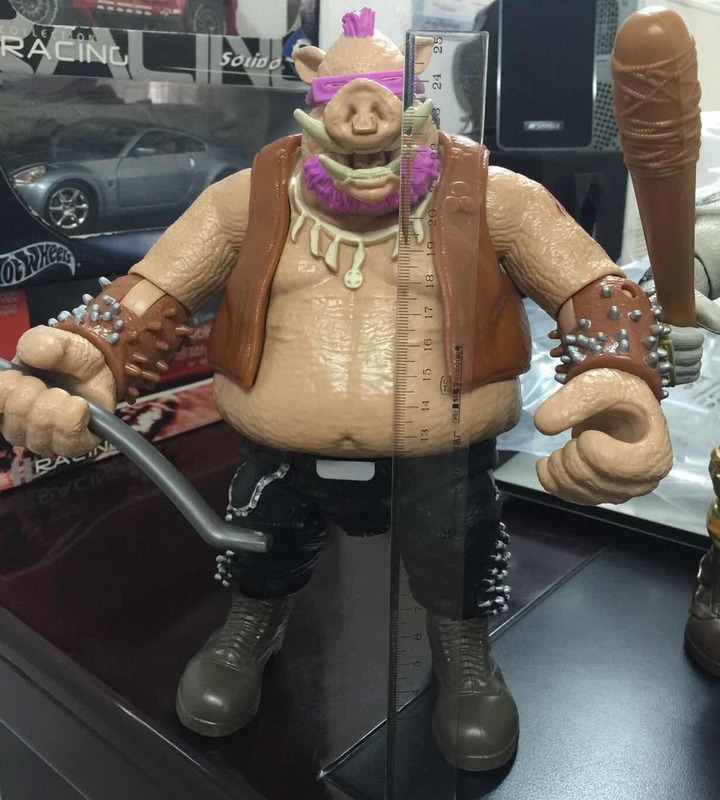 These crazy “Movie Star” bootlegs have been littering auction sites and internet stores for months now. 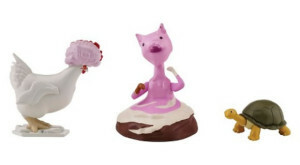 They are kooky as hell, but are not as BAD ( or as good ) as one would think. 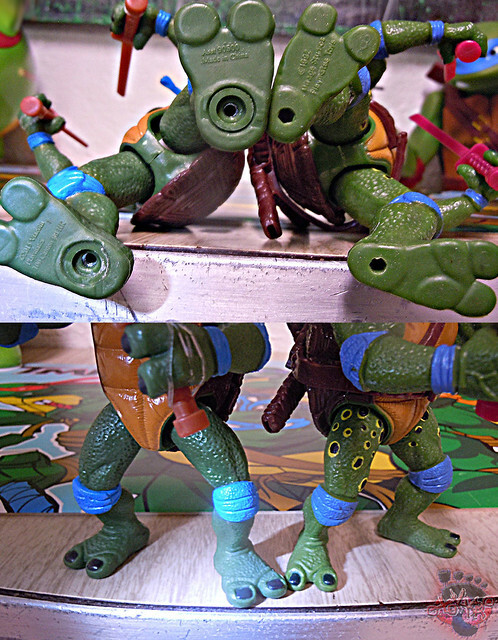 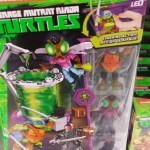 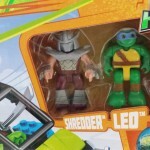 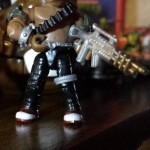 The nutty bootleg Movie Leo has some interesting qualities similar to reproduction that comes with the set, like the harder plastic and weird alterations. 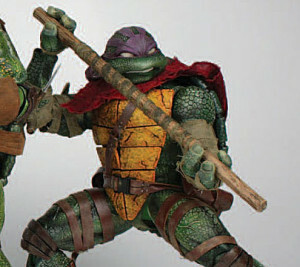 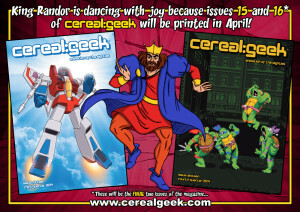 .. here’s ’07 Movie Leo for fun. 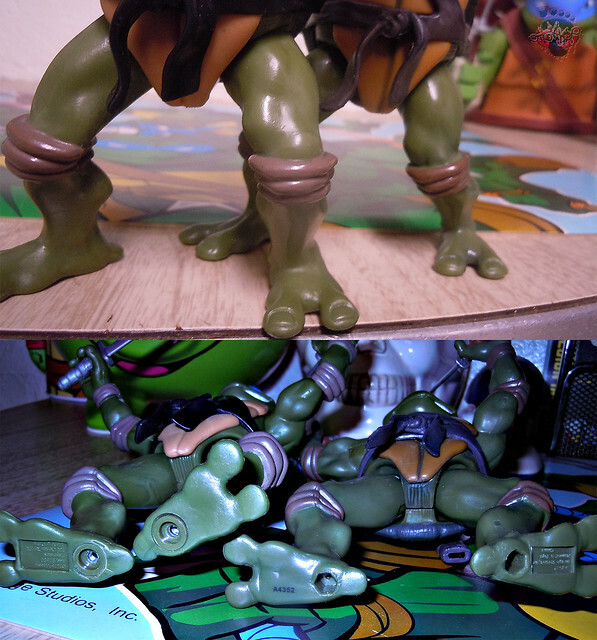 Another custom CLASSICS line fig with Tokka paint work for comparison. 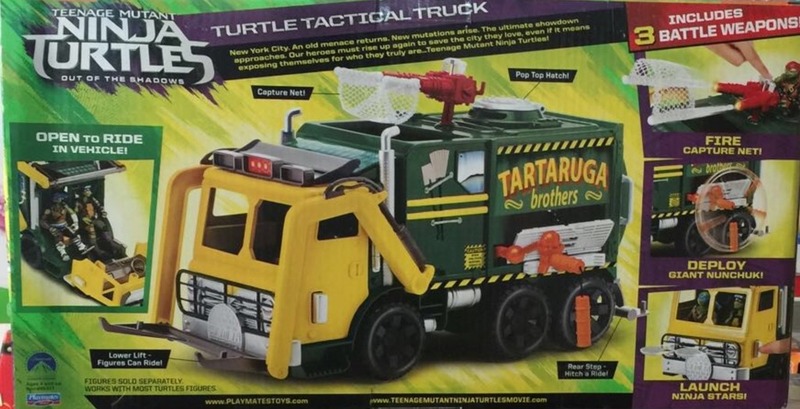 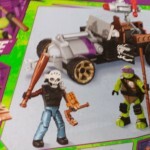 Via our old pal NACHO on the Technodrome :: TMNT: OUT OF THE SHADOWS, PLAYMATES TURTLE TACTICAL TRUCK ..
.. ** This peek also gives us a glimpse a little at the new sculpts of the TURTLES 2 figs themselves. 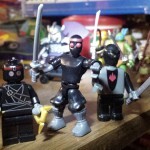 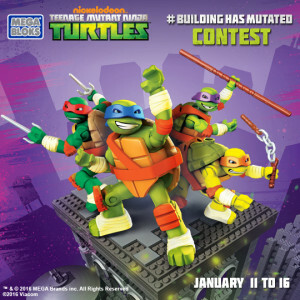 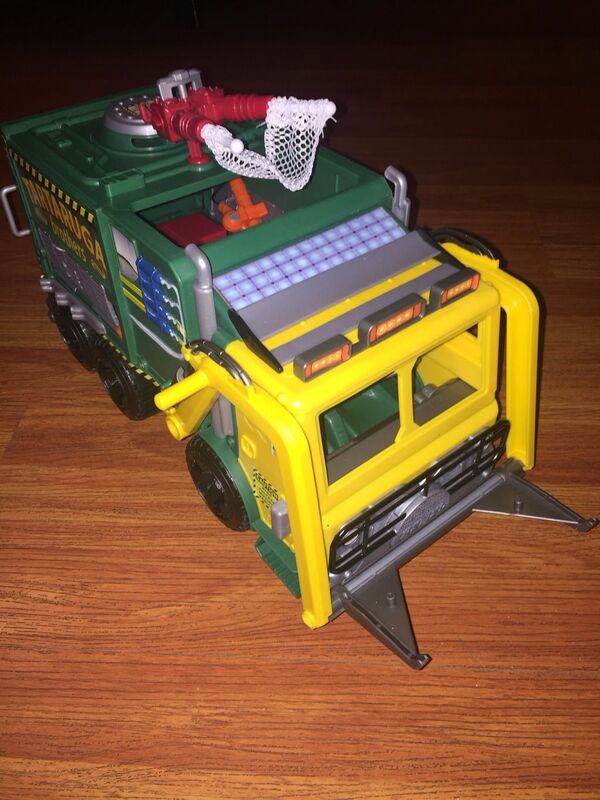 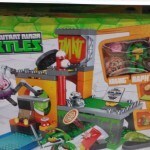 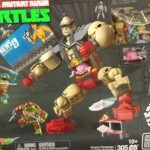 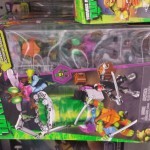 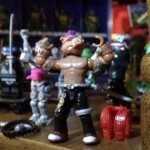 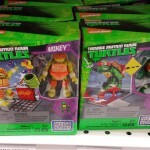 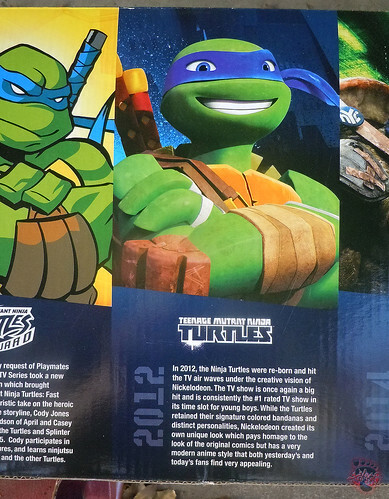 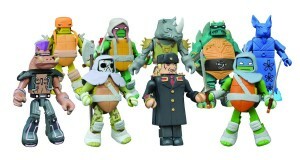 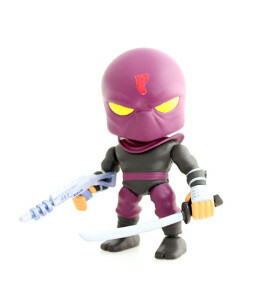 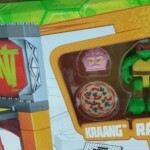 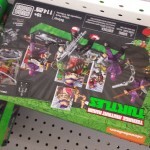 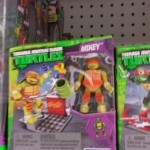 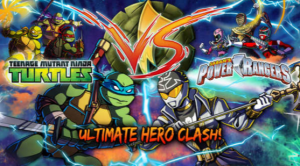 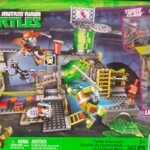 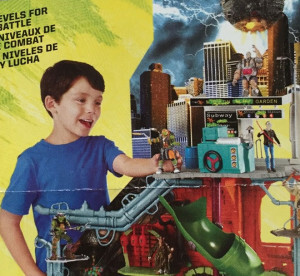 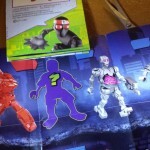 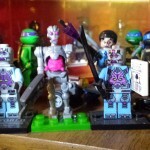 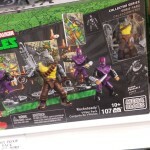 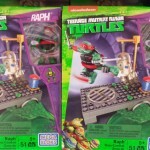 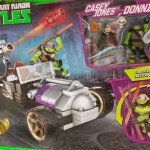 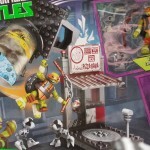 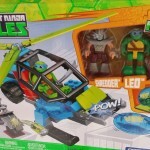 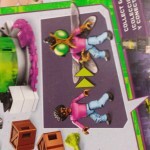 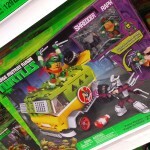 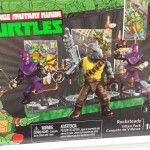 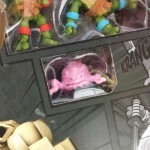 ** TMNT MEGA BLOKS are hitting online & brick n’ mortar retail right now. 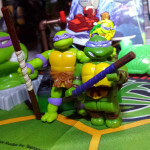 The past 24 hours or so, Tokk’s been able to get a small sampling myself of a couple of blind bags and 2 collector’s sets featuring Donatello & Bebop in their MB Interpretation of their classic toon forms.